As the son of Hollywood and Broadway funnyman Mel Brooks, one would expect a book by son, Max, to be rife with the same over-the-top, bawdy and side-splitting humor for which his father is notorious. Especially considering the subject of choice: Zombies. Brooks' previous effort was a comprehensive Zombie Survival Guide which outlined how the common North American civilian could survive zombie attacks on a small scale, as well as how to survive the catastrophic possibility of worldwide infection (by Brooks' reckoning, zombieism is a condition brought on by the virus Solanum, not reanimation by dark, supernatural forces). 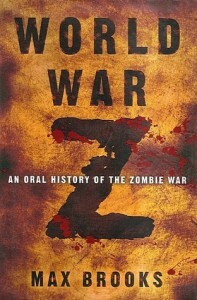 In his latest work, World War Z: An Oral History of the Zombie War, the absolute worst has come to pass. Through ignorance, miscommunication, unpreparedness and sheer negligence, the entire world has been overrun by the living dead. Yet instead of a comic rendition of zombies roaming the earth and being systematically wiped out by the oft-cast, steely-eyed and determined Hero, we are given a vivid recounting of humanity in a war for survival against the overwhelming hordes of undead which very nearly wipes the living human race from the face of the earth. Brooks presents this history in a series of interviews with principle characters across the globe in a conflict that has lasted, and in some respects continues, for ten years. These interviews are grouped into chapters from the initial detection and outbreaks, to reactions from numerous governments which vary from mobilization to denial to isolation to complete ignorance, through the conflict and the aftermath as the world rebuilds. Those who have survived to offer interviews show the effects of the conflict in very visible ways, from those who are psychologically shattered to those who discover something new and purposeful about themselves when before their value was negligible. They are very often unheroes, with little social worth or self-respect, who rose to the occassion when the world fell under attack. Throughout, Brooks emphasizes the changes from the world as it was: political disunity, racial and class discrimination; to the world that it has become: unified in the purpose of survival, then victory. It highlights the wastefulness of government, the shattering of the social structure (who needs actors, entertainers or athletes in a world where survival is paramount? ), and the galvanization of the entire species with the purpose of achieving a single goal. The book essentially states, without ever saying as much, that the near extinction of humanity by the living dead is the best thing that could ever have happened, returning a sense of urgency and purpose to a very sedentary people. The book is a statement on how the dominant species of our planet is, in truth, extremely vulnerable. This book is not utterly without humor, though the younger Brooks does not express it in the same explicit fashion as his father. There are various, subtle references to movies (Ghostbusters), cartoons (Transformers), video games (Myth) and even his own Survival Guide (which is snubbed by one interviewee as "clearly written by an American") which only someone who has come into contact with them will catch. Yet these humorous instances are downplayed because the main thrust of this book was not comedy, as booksellers would lead you to believe. Perhaps this oral history was created with ironic, comic intentions, but the message it conveys is one of very serious warning. We are a fractured people full of needless bile, and if we could but work together rather than focus upon our differences there is no obstacle we cannot overcome. But if we choose to remain stubborn, indignant and hateful, ignorant of one another and our respective cultures, we will almost surely be swallowed up by whatever disasters, be they zombies or otherwise, which lurk just around the corner.